It’s no secret that we make banners and print banners for Perth businesses, but did you know we also install banners as well? Banner installation is something we have done for years and with our decades of experience we can help you with the best method to install your banners. Whether it’s using standard ropes and eyelets, or elastic cord, or even sailtrack edging, we can advise the best method to install a banner. We also do location scouting to see where the best place to position your banner is. Some things that have to be taken into account are the wind loading, the positioning for the sun and the height at which the banner will be installed. Seen above is just one of the banners we have installed, being on a second storey and away from the wind. The client was very impressed with how it looked and how it has held up. If you need a banner printed and installed, then contact us by clicking on this link and we’ll get back to you soon with a quote. 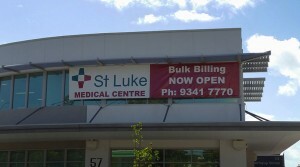 This entry was posted in Banners and tagged Banner Installation Perth, Banner Printing and Installing, Banner Printing Perth by Banners Perth Staff. Bookmark the permalink. Could you please quote on suppling a printed banner with eyelets for outdoor use. Also what format you prefer the image file supplied.